Since this was our last day in the Mekong Delta, my eyes lit up when I spied this busy little stall with a sign that read Bún Mắm Sóc Trăng, fish noodle soup from Sóc Trăng, and a high turnover of patrons that stopped by for a chat and some sustenance. It didn't matter that I had just had lunch, especially since lunch was at Nha Hang Hoa Su, a clean tourist-class (read bland) restaurant. I gestured to the lady and was eventually presented with a steaming bowl of rich fish broth no doubt flavoured with Mắm cá linh, a fermented fish paste. 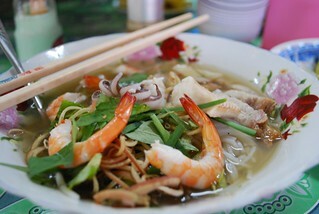 The tastiest fish soup we had in Vietnam was this exemplary bowl of noodles. The flakes of catfish were firm and fresh, and so were the prawns. The sprinkling of sliced banana flower, 韭菜 garlic chives and Vietnamese mint provided a bit of crunch.